Keith Richards is a few months shy of 74 years old, which means he technically has about six good years left on this planet, if you believe the average life expectancy datafor men in the U.K. Of course, the legendarily unkillable Rolling Stones guitarist should’ve died about 37 times by now, which proves he’s immortal and will outlive us all. Here are some of the fun things that Richards has reportedly done to his body in his long and splendid life: mixed his dead dad’s ashes with cocaine and tried to snort him; nodded off with a needle in his arm, only to wake up in a house engulfed in flames; went on a three-day acid binge with John Lennon, during which they mostly just drove around in circles; fell out of a palm tree in Fiji; got electrocuted on stage; smoked pot laced with strychnine, a pesticide; and stayed up for nine straight days without sleeping, which seems pretty tame by comparison. Now, I’m not saying you can steal all of Richards’ immortal powers if you buy his New York City penthouse, which he recently listed for $12 million and ostensibly contains some kind of mystical aura that makes its inhabitants impervious to the natural hand of death. But I’m also not not saying that. In any case, get a load of this place. 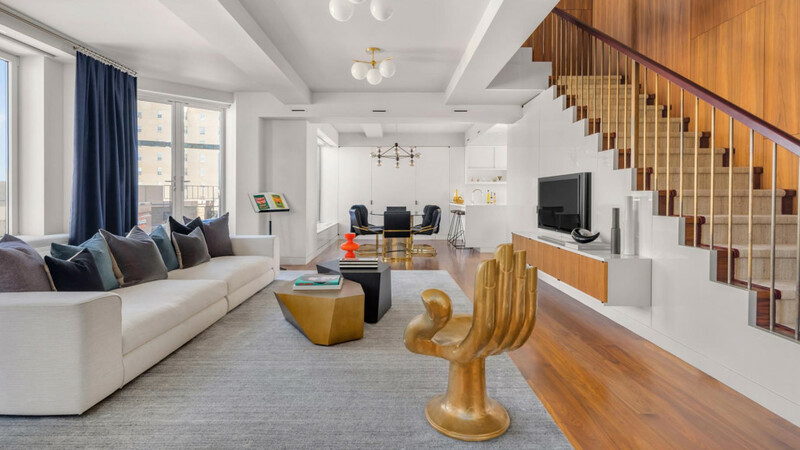 The 2,700-square-foot duplex, which boasts scenic views of Fifth Avenue and Washington Square Park in lower Manhattan, has four bedrooms, four bathrooms, and three terraces for good measure. The main living area is 47 feet long, which seems a bit much, but so does Keith Richards. Other fun features include a steam shower and tub, a giant gold hand chair, and wallpaper that says, “You’re never too young,” a mantra that you must repeat to yourself at least six times an hour if you live in Keith Richards’ house. Check out the listing and more photos of Richards’ penthouse at Douglas Elliman.